As early fall turns to later fall, and the chill in the air begins to envelop the nation, we once again turn our sights to the national pasttime. The playoffs are in full bloom, with both the ALCS and the NLCS set — all four Divisional Series went the full five games (a rather amazing feat), with the junior circuit pitting the Tigers of Detroit (who beat the A’s) against the Yankees of New York (who defeated the softball-top donning Orioles). Over in the National League, the Giants of San Francisco pulled off an incredible feat, dropping their first two games at home, then winning the next three games on the road in Cincinnati (who lost the deciding game in a softball top), to defeat the Reds. So, of the first three teams to reach the Championship Series, you have the 2006 Runners-up (Detroit), and 2010 (San Francisco) and 2009 (New York) World Series Champions. For those of you who missed it late last night (and it was one helluva game — featuring the largest ever comeback to win a deciding game in the history of ever), down in the nation’s capital, you had the 2006 and defending 2011 Champion St. Louis Cardinals taking on the upstart Washington Nationals. The Nationals, established in 1905 nÃ©e Les Expos de MontrÃ©al in 1969, were seeking to win their first post-season series since 1981 (a team that may have even made the World Series were it not for a Blue Monday), and the first post-season series in the District of Columbia since 1924, when the Washington “Senators” won the World Series. Of course, had not Bud Selig ruined baseball forever fostered the strike of 1994, they may have won that year as well. Could this much-traveled, oft-unlucky, much-maligned franchise slay the mighty, defending-champion Cardinals? You had to like their odds when they came out wearing a uniform, and not a softball top, and they sprinted out to a 6-0 lead after 3. The defending champs battled back to close to 6-5 in the 8th, but those pesky gnats, er… Nats, scratched out an insurance run in the bottom of the 8th to pull ahead 7-5. Warming up in the bullpen to close the deal was Stephen “the Strasiah” Strasburg… Oops. Unfortunately, they needed a better salesman. The Cardinals scored 4 runs in the ninth, taking a 9-7 lead. They would defeat the Nats by that score. Sorry Arr Scott…you’ll need to wait another year to finish that victory drink. Even as a Mets fan, with the Nationals as rivals in the NL East, I had to feel bad for that team — they’d come a long way in a short time, winning the NL East, securing the home field, one out away from popping corks. But it wasn’t to be. So we welcome back the defending champs into the post-season fold. Tigers at Yanks tonight (8:00 eastern start), while the Cardinals are moving west tomorrow evening. So I have this old book from 1955. “Inside Baseball for Little Leaguers.” Had it since I was kid. Lotta fun things about it. Duke Snider on the cover, for instance. Also the many portraits of Big Leaguers, and the Little Leaguers playing in what appear to be generic Chuck Taylors. But what I like so much about it NOW are the fake logos on the inside covers. As was the case back then when team names, et al, were not quite so protected, if someone didn’t have the rights to use teams’ actual logos, they’d just do their own version of them. That practice lasted well into the 1970s, as evidenced by all the ersatz patches that show upon eBay and occasionally in Brinke’s “Collectors Corner” here at UW.. Anyway, I kept thinking, “Wonder what they’d look like color and, man, those pseudo logos would make great-looking teeshirts. ” And, while I haven’t got up the energy to actually paint some for myself, I thought I might as well plant the seed with any DIYers out there. So I messed around with a few them in MS Paint, which is the upper end of my computer skills. Not saying they’re correct (visually or otherwise), just that they’d maybe make pretty interesting one-of-a-kind tees. Nice job Rick — what say you DIYers? Anyone want to take a shot at creating one of these? In case you’re interested I put together another playoff tree/uni tracker for this season. Looks nice with every available jersey slot taken up so far. I’m pretty sure all but 4 jerseys were worn (not counting the Braves and Rangers). For today’s TV game we finally got to see some scoring, even though it was a blowout in an intrastate rivalry. … Pre-Bo Schembechler Wolverines, of course, so they weren’t what they’d be by the end of the decade. … Unis for both teams were pretty simple, but you gotta like Michigan State in KELLY green and the “M” on Michigan’s sleeves. … Also, the Wolverines’ helmet TV numbers should be maize. … Was tough to tell in black and white. … Michigan was one of a few schools still using black laces in their cleats (Purdue, Washington and Oregon State were others). … About the players: Ernie Clark played LB for several seasons with the Lions and Cardinals. … Dave Raimey had a long and stellar career in the CFL with Winnipeg and Toronto. **NOTE: Because my DirectTV now also includes both NBS Sports and CBS Sports I ran a count. Last week I had more college games to watch on a single Saturday than during the entire 1962 regular season (that’s not a “Walked five miles to school, uphill, both ways” thing; more like, “Is this great or what”). Thanks Rick! Great job with that as always. Fantastic shot (albeit a newspaper clipping) of “Crashing the Wolverine Line” — might make for a great colorization! Hey I’m new to your site and love it. Have you ever done any posts on how the Bengals could redesign their awful uniforms? I did this one a year or so ago to probe a point to a friend. The cat logo (head only) is pretty awesome in my opinion yet they go with the stupid “B” as their primary logo. Do you know why they do that? Seems like they had the head as the primary for a while and then switched to the B on their own accord. Which is probably just another example of poor management of this team. Hi my name is Daniel Easley. I’m 16 years old and I’ve been reading Uni-Watch for years. This isn’t exactly a uniform concept, but with the Minnesota being named to host the 2014 MLB All-Star Game I decided to design a Logo for it. Not even my stirrups and Jeff Blauser’s pants (seriously) could help the Braves not beat themselves last night. We were at an early Halloween party. I don’t ordinarily wear the pants. I was dressed as an Atlanta Cracker but no one really got that. Today’s stirrups are a vintage pair I recently received. No idea what team, but they are they are for my Louisiana Tech Bulldogs today. Going with the classic O’s once again. I know I’m a bit of a stirrup broken record right now, but feel duty-bound to pull for my team as long as they are in it. Also stayed with the ’66 World Series theme with a copy of the program as a prop. As you can imagine, every player is sporting the ‘rups in that era. And that’s it for this fine Saturday folks. Enjoy the college football today, and the baseball tonight. And … we’ll … see … you … tomorrow … morning. Red needs to be excised from the Buccos forever. But Tampa Bay has always had red as part of their color scheme. Pewter & orange would look funky. I’m talking about the Pittsburgh Pirates. The ORIGINAL Bucs. With that said, I take it the book was from just before the Redlegs controversy, since the Reds logo says Reds in it? Great Bengals look. Very clean and uncluttered. Just because you can add a lot of curves and swooshes doesn’t mean you should. Only thing: Bengal head should be facing toward the front of the helmet. The White Sox logo looks like its masturbating. Well, yes, those 1955-ish fake logos were, um, “oddities”. Pretty much why I thought they were worth a look. What the heck is wrong with that Cleveland Indians logo? His left arm appears to be coming out from the middle of his torso. If someone on my softball team showed up with a batting grip as evidenced in the Cincinnati Reds logo, I could definitely see the fielders moving in quite a bit. 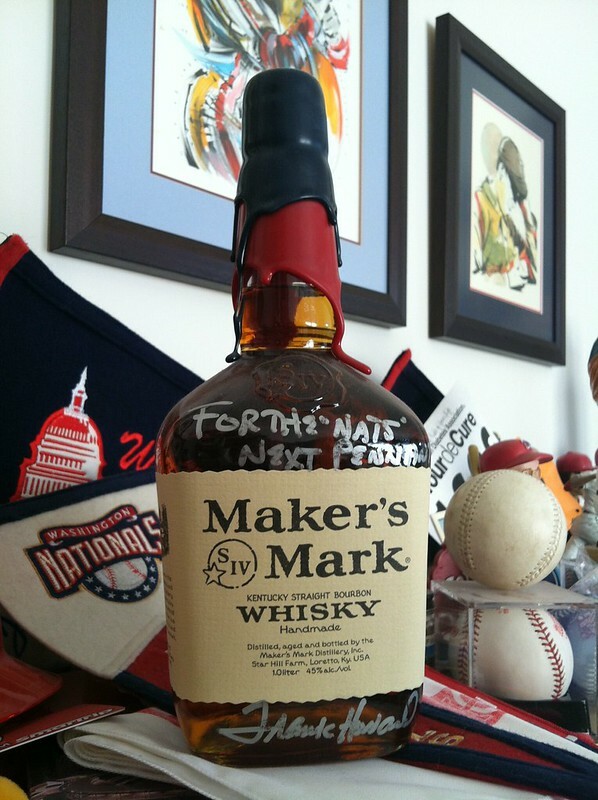 No need to wait on the victory drink – the Nats did win a pennant this year, after all. Just looking to put together the right shindig for it. Had hoped it would be a celebration, but a wake it will have to be. The wound is still fresh so even typing this hurts a bit especially in the fashion that it unfolded last night, but if you were to ask at the beginning of the season if I would take an outright NL East pennant and taking the defending champs down to the wire in the first “real” round I’d take it. I’m really looking forward to seeing a banner raised (by this franchise) in the spring and a healthy pitching staff for the entire season. Arr Scott were you as irritated as I was watching the broadcast last night with the constant references to the Senators? At one point they compared the attendance at Nats Park to Griffith Stadium like they just moved from there. I thought that O’s logo looked familiar. All the teams that wore softball tops in this postseason are out. And of the teams left, only the Giants have a softball top in their wardrobe. I’m pretty sure that Red Sox logo isn’t one made up by the publishers. Inside Fenway Park, there’s a brick wall with the evolution of the team logo, and there’s definitely a anthropomorphic sock on the timeline. I thought I took a photo last time I was there, but it’s not showing up anywhere on my computer. I agree. More that one of them either is, or is very close, what the teams used. But others are fictional. As as I said, just an odd little collection. Ricko, great Benchies today. Mongo sad. Agreed. Puts a melancholy spirit in my Detroit sports fandom today. Thanks for the tribute. A tip of the cap to thee. Didn’t do all of them. Had trouble imagining that “bum” in royal blue satin. The Braves and Indians logos would not get the Uniwatch/Lukas sealof approval. Tell that to the people who sanitized the Tampa Bay Rays’ cigar throwback. Looks much better than the all white. I’ve said I want to see purple pants with the road set but I’ll take the black. Minnesota looks very good as well. Other than that stupid collar. Both teams looked great in that Victory Right game. Not too bad looking today either. Purple pants would be better. As a Northwestern fan, I agree. As a person that is sick of Black pants – I further agree. This week’s installment of Ricko’s kid cards date to right around the beginning of the Cuban Missile Crisis. Tell you what, watching JFK announce the Cuban blockade was chilling. I think everyone in America had a sense we were staring the possibility of nuclear war squarely in the eye. While he was talking you could almost hear your own heart beat. And maybe the heart of the person next to you. It was, to say the least, terrifying. The Orioles clearly lost because they were wearing the “O’s” caps and not their sublime Cartoon Bird caps. What a shame. Sports logos are always fun to look at. These were fun also even if I am not used to seeing them. 50 years ago today is one thing I look forward to. I was flipping through the TV channels the past few Saturdays. Thinking about how many college games I have to choose from. It is amazing compared to the old days long ago. A Minni decal just broke due to contact from a Northwestern player. Lots of talk and replays on ESPN2. btw, the Gopher hockey team played the University of Lethbridge this week. Is that a great nickname or what. Sounds great, but what in the name of Odin’s Ghost is a “Pronghorn”? The American “Antelope”: found in the Great Plains. Can’t speak for 2012, but driving from Calgary to Regina about 30 years ago you’d see them all over the Canadian prairie. The Washington Senators were in the World Series in 1933. Next season, would Minni/NU be the first ever brick number bowl? That Senators logo tshirt is gorgeous. Once again, I wish that was the club’s name (to say nothing of the “W”). I agree with Chance on both counts. So do we know why they didn’t use the official team logos? Couldn’t have been copyright issues, since that’s an official Red Sox and Oriole logo (at least), and they’re using the distinctive word marks of many other clubs. Possibly they wanted mascot-based logos, preferably full-body, and invented them when they had to? That doesn’t explain the Yankees, but would account for others. Full-body mascot logos lend themselves to ample use in cartoons etc. That’s why I figured. Wanted something more than, say, a hat for the Phillies. Wanted a “mascot” for every team. In reference to the last quote…the Cubs also did it in 2003, beating the Braves in Game 5 of the NLDS at Atlanta while wearing their blue tops. Some friends of mine gave me some pumpkins that they were gorwing in their backyard. I thought about carving Gary Bettman’s face in one of them, but I fear that might unduly traumatize some people in the neighborhood. This isn’t uni-related, but in an in-game interview after halftime, Frank Beamer mentioned “When we left the hotel this morning..” Virginia Tech is playing at home. Is it common practice for teams to stay in a hotel the night before a home game? Extremely common. It’s the norm probably at every major program. Phil, I grew up watching the Expos, went to a bunch of games (especially once I moved closer to Montreal), lived through the heartbreak of Blue Monday and 1994. I know that corporately, franchisewise, its legally the same team (I get that). But its not the same team. I watched last night’s game neither rooting for the Nationals because they used to be the Expos, nor rooting against them because they used to be the Expos. They’re just another team. Maybe its like a Gotye song. They’re just somebody that we used to know. Its easier to get on with your life than hating them from a distance, or hanging around outside their bedroom window. Yes, the Expos were 1981 NL East champions, and you seem irked that the Nats don’t acknowledge this…and I’ve seen a lot of grousing about the fact that the Expos’ retired numbers were unretired in D.C. But if that’s the case, then why don’t we see a 1924 World Series banner at Target Field? Or a 1944 AL pennant at Camden Yards? Where’s the acknowledgment of Walter Johnson in Minneapolis? Of George Sisler in Baltimore? Both franchises made an almost complete break with their history – same as the Nationals did. Like the Senators/Twins and Browns/Orioles, the Expos/Nationals are trying to balance recognition of their franchise past and tying the current team to the city’s baseball history. The media guides will bear out this approach. I get the feeling this is going to remain a frequently played argument in the years to come…at least until we can convince teams to stay put in their cities for all eternity. I wouldn’t hold my breath that that’s going to happen anytime soon. There are eras involved in this, too. The TV era, the radio era, the newspaper era. It is easy to see the 20th century teens as when baseball finally took shape. Football and basketball largely were solidified in the post-WWII era or with the advent of TV. TV exposed SO many more people to these leagues and their teams, which largely is what those are the times when everything came together. The 1901 Orioles weren’t part of that solidifying in baseball. Neither were, for example, the Duluth Eskimos in football, a franchise that technically is (I believe) now the Washington Redskins. Also, its interesting to me (and maybe only me) that its four pre-expansion teams in the league championship series. In fifty seasons of post-expansion baseball, two expansion teams have never faced each other in the World Series? Funny how that’s worked out. There are expansion teams in both leagues that have won multiple pennants*, but we’ve never had two of them come though in the same year. Not only that, but two teams each making their first appearance in a World Series hasn’t happened since the Cubs and White Sox faced off in 1906. The Diamondbacks and Mariners almost did it in 2001. Oklahoma State uniforms vs KU – Carbon fiber helmets (NEW), white jerseys and gray pants. Somebody with a DVR, please check the back of Iowa #60 at 3:30:47pm today. (Before the 3rd & 7 in OT.) I’m not sure whether he had mud on his jersey or whether the 0 was flapping in the wind. WVU at Texas Tech wearing white on white with a new look to their gray helmet. No stripe and no outline on the gold Flying WV. Ill try to get a screen shot. Their playing is matching that garbage right now. how is it ok for Boise to wear gray jerseys against Fresno wearing white? Must be a MWC thing. UNLV wore gray in losing to Nevada in white. I know it wouldn’t be historically accurate for the period, but I’d like to see that A’s mascot colorized with a gold uniform and kelly green trim. Personally I didn’t mind the BYU blackout look. Hoosiers in #LaFlamaRoja against AN Ohio State University. Some Hoosiers are wearing pink accoutrements but no pink helmet logo this year (thank jeebus). Trinity High School in Louisville (UofL star Brian Brohm’s alma mater) went pink Friday night against Male (UofL star Michael Bush’s alma mater). Zero percent chance of softball tops in the ALCS. Very slim, and impossible in a NLCS. Just flipping thru and caught some of the Baylor game. They had a close-up of the goal line pylon and it had…a Nike logo on it. Check that, FOUR swooshes on it. One on each side of course. Why does a pylon have a corporate logo on it at all? To be fair, I’d be just as furious if it were Coca-Cola or Alpo. What’s next, the 40-yard line sponsored by Schlitz Malt Liquor? The red zone sponsored by Tampax? South Carolina is playing with gray jerseys and gray camo pants tonight at LSU. The two grays don’t match. If anyone has access to CBC on their cable system, they are showing a Stanley Cup game from 1979, Bruins at Canadiens semi-final game. Fun to see a game with no helmets and no ads on the dasher boards or ice for that matter. LSU in traditional uniforms – White jersey, Gold Helmet/pants. So. Carolina in horrible Camo pants and undershirt, with GREAT dark Gray jerseys. The uniform is a nauseous fail, but he dark Gray jerseys are as good a Gray jersey as I have ever seemn for football. Had So. Carlina paired it with Scarlet or Black or White pants, this uniform would be an “A”, a “B+” at worst. Let’s end the Camo Madness along with BFBS – with one good UniLaw !!!! No screenshot, but it looked like the South Carolina kicker was wearing glasses after the late onside kick. Not sport glasses, but regular eyeglasses. I’m assuming he was wearing them under his helmet. Did anyone notice this? Saw this. The frames appeared to be visible (heh) when they showed a close-up of him before the onside kick. He’s not just an Oriole killer, he’s an equal opportunity killer. when do we find out he’s wearing an “S” under his uniform?